Tipton Green Junction is a minor waterways place minor waterways place place on the waterways major waterways place village town city on the Birmingham Canal Navigations (Old Main Line) between Tipton Factory Junction (Junction of BCN Old and New Main Lines. Access to the Barge & Barrel PH) (5½ furlongs to the northwest) and Tipton Junction (Junction of Dudley Canal No 1 (Lord Wards Canal) with the BCN Old Main Line) (2½ furlongs to the southwest). 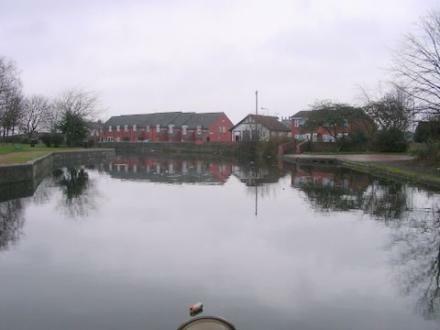 The nearest place in the direction of Tipton Factory Junction is Coronation Gardens Moorings (14 day moorings); ½ furlongs away. The nearest place in the direction of Tipton Junction is Tipton Green Bridge (The new bridge carrying Park Lane West over the canal is right next to the old bridge. The gap between the bridges is in the verge. ); ¾ furlongs away. Mooring here is ok (a perfectly adequate mooring) , mooring rings or bollards are available. Mostyn Building Lower Church Lane Unit 8, Tipton, DY4 7PE — 1462 yards to the east. 51 Owen Street, Tipton, DY4 8HE — 152 yards to the north. 50 Hurst Lane, Tipton, DY49 — 534 yards to the northwest. Black Country Living Museum, Dudley, DY1 4SQ — 717 yards to the southwest. Castlegate, Tipton Road, Dudley, DY1 4TA — 1406 yards to the south. West Midlands, Tipton — 305 yards to the southeast. @Lynze Loves, Tipton, DY4 8QL — 85 yards to the north. Tipton — 85 yards to the north. Unit 12 Hale Industrial Estate, Tipton, DY4 7PQ — 1557 yards to the east. 3 Owen Street, Tipton, DY4 8EZ — 338 yards to the northeast. Tipton — 556 yards to the northeast. Tipton — 1328 yards to the east. 243 Dudley Port, Dudley, DY4 7 — 1594 yards to the east. Unit 12 Hale Trading Estate Lower Church Lane Tipton DY4 7PQ, Tipton, DY4 7PQ — 1549 yards to the east. 110 yards to the southeast. Owen St, Tipton, DY4 8 — 492 yards to the northeast. Restaurant 3, Castle Gate Park, Birmingham Road, Dudley, DY1 4TA — 1376 yards to the south. Castlegate Park De Vere Village, Birmingham Road, Dudley, DY1 4TB — 1422 yards to the south. Sedgley Road West, Tipton, DY4 8PX — 178 yards to the northwest. Castlegate Leisure Park, Dudley, DY1 4TB — 1241 yards to the south. 40a Dudley Road, Tipton, DY4 8DL — 338 yards to the west. 501 Birmingham New Road, Dudley, DY1 4SB — 775 yards to the southwest. 501 Birmingham New Road, Tipton — 768 yards to the southwest. 57 LOWER CHURCH LANE, Tipton, DY4 7PG — 1500 yards to the east. Unit 4, Castlegate Park, Dudley, DY1 4TA — 1393 yards to the south. Sedgley Rd East Unit 7, Tipton, DY4 8XA — 1086 yards to the southeast. Grace Road, Tipton, DY4 0 — 1564 yards to the northeast. Walker Grange, Central Avenue, Tipton, DY4 9RY — 1012 yards to the northeast. Castle Court 2, Dudley, DY1 4RH — 1612 yards to the south. Castlegate Way, Dudley, DY1 4TA — 1465 yards to the south. Tipton Road, Dudley, DY1 4SQ — 735 yards to the southwest. unit E3, Tipton, 8888 — 85 yards to the north. Dudley — 1438 yards to the southwest. ATLAS TRADING ESTATE, Tipton, WV14 8TJ — 1570 yards to the east. Castle Gate Way, Dudley, DY1 4TA — 1241 yards to the south. Castle Gate Way, Dudley, DY1 4TA — 1299 yards to the south. Castlegate Way, Dudley, DY1 4 — 1332 yards to the south. Castle Gate Park, Castlegate Way, Dudley, DY1 4TA — 1301 yards to the south. 79 Groveland Rd, Dudley Port, Tipton, DY4 7TB — 1444 yards to the southeast. Dudley Port, Tipton, DY4 7 — 1472 yards to the southeast.